it's been a while that I'm using Android Studio, and up until now I was using 1.0.1, gradle was a bit slow, around 1.5 minute for assembleDebug (my project is really big!) but today I updated my AS to 1.2 and now same process takes about 7 to 10 minutes, and sometimes even with no result! is there any setting I have to change to make it faster ? honestly taking 10 minute for every debug run is a nightmare ! What I did was to change the global gradle settings to offline work which can be done by going to Preferences => Gradle. This did make a difference. Please check out this link for more options as well as a detailed explanation on speeding up gradle. I was testing my app with Google+ log in. So I added release signing to debug version. App compiling in ~ 26 seconds. When I remove that ~ 7.5 seconds. Now my app compiling in ~ 4.5 seconds. Upgrade android studio to version 1.3(stable) or above 1.4(beta at the time of writing this). Upgrade gradle to 1.3.+(+ can be replaced with some positive number) change it in your build.gradle file. change your gradle-wrapper.properties files and add distributionUrl=https\://services.gradle.org/distributions/gradle-2.4-all.zip in last(you can remove any old entry). Go to Preference -> Gradle and set it to work offline. turn multiDexEnabled to false in your build.gradle file (for debug only, keep it for release). Not the answer you're looking for? 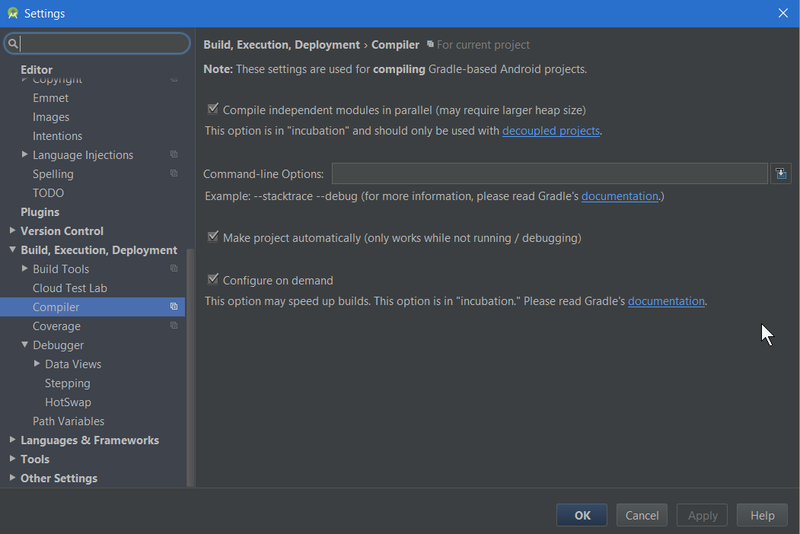 Browse other questions tagged android android-studio gradle or ask your own question.